On April 13, 2011, the European Blind Union, the Trans Atlantic Consumer Dialogue (TACD), the International Federation of Library Associations and Institutions (IFLA), the European Dyslexia Association (EDA) and MEPs Luigi Berlinguer, Eva Lichtenberger and Francisco Sosa Wagner held a meeting at the European Parliament on Fair Access to Culture and the Right to Read of Visually Impaired Persons: Exceptions and limitations to copyright with regard to libraries, education and print disabled persons. While several areas of access were addressed, the audience and the focus of the meeting was mostly about persons who are blind or have some connection to disabilities issues, and the position of the European Union on the proposal at WIPO for a treaty on copyright limitations and exceptions for persons with disabilities. (More context about this negotiation is available here). These are pictures and notes from the event. Ádám Kósa, a Hungarian MEP from the Group of the European People’s Party (Christian Democrats) presented at the beginning of the meeting. Kósa is the first deaf member of European Parliament. His entire presentation was made using Deaf Sign Language. Kósa focused on the importance of access to culture, to the enjoyment of life. Kósa expressed frustration at governments adopting high minded but general statements, if they are not followed by the concrete and practical measures that are needed to improve access for persons with disabilities. “Are these just words in the wind?” he asked. Angermann explained how difficult it is to make copyrighted works truely accessible, particularly when there are tables with data, graphs and pictures that require considerable labor to make accessible to someone who is blind. Angermann explained that when a European blind person asks a US source, “can you lend us a copy in Germany?” The answer is no. “That’s the situation. You have to have a friend who can read it. Or find a printing house that can make an accessible copy. Isn’t it a terrible waste of time and money?” he asked. Rodolfo Cattani is the leader of Italian Blind Union and secretary general of the European Disability Forum. At one point in the discussion, he said that the European Blind Union would rather be defeated in their efforts to get a strong legally binding treaty than succeed in getting a soft non-binding resolution. Eva Lichtenberger, an MEP from Austria, urged the European Commission to support the treaty, as did Francisco Sosa Wagner, an MEP from Spain. Helga Trüpel, a Green MEP from Germany, pressed the European Blind Union on the issue of piracy. Trüpel, a strong defender of copyright, is said to be interested in the job of Minister of Culture in Germany, if the Greens do well in the next election. She spent most of the three hour meeting listening carefully to the presentations by the proponents of the WIPO treaty. This was Tilman Lueder’s last public act as Head of Unit for Copyright for the European Commission’s Directorate for Internal Market. Lueder defended the European Commission’s backing of voluntary stakeholder agreements, and asserted that works created under exceptions anywhere in the European Union could be exported and imported across national borders within the EU, under its single market rules. At times, Tilman complained about those who wanted “complete harmonization” of copyright exceptions, a term that many saw as a red herring as regards to the WIPO treaty for disabilities, given the flexibility countries would have in implementing treaty obligations. Dan Pescod of the World Blind Union was one the main organizers of the event, and is deeply involved in the WIPO treaty discussions as well as the EU and WIPO stakeholder discussions. Pescod began by describing the differences between the EU and WIPO stakeholder discussions, and then provided a lucid and compelling rebuttal of the arguments for inaction on the treaty. David Hammerstein is a former MEP from Spain, who now represents TACD in Brussels. David sharply criticized the lack of transparency that allows the countries opposing the treaty to hide behind secrecy. David’s blog about the event is here. Malika Benarab-Attou, a Green MEP from France, has pressed the French government to support the treaty. The EBU members attending the meeting were there to overcome the opposition of the treaty by the officials from the European Commission. Olav Stokkmo is the CEO of IFRRO, short for The International Federation of Reproduction Rights Organisations. Olav is one of several lobbyists pressing MEPs and their staff to reject the treaty. The same week of the Parliament event, WIPO held three days of informal consultations on proposed treaties for broadcasting organizations, performers, and disabilities. The WIPO Standing Committee on Copyright and Related Rights meets June 15 to June 24 in Geneva. Update: At the private WIPO informals on Friday, April 15, 2011, the European Union said it would only support a soft recommendation with a 3 to 5 year period to evaluate it. The USPTO said it wanted to move first on a soft recommendation, which it thought would “solve” the problem, but after a few years of experience with the soft approach, it would allow the SCCR to see if a treaty was necessary. Millions of blind EU citizens face a “book famine” in which only a few per cent of books are converted to “accessible formats” they can read such as braille, large print or audio. 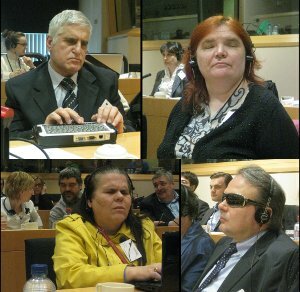 On the 13th April, the European Blind Union highlighted this situation at an event in the European Parliament in Brussels. The meeting was hosted by MEPs Berlinguer, Lichtenberger and Sosa-Wagner from Italy, Austria and Spain respectively. Discussion focused on a draft treaty that the World Blind Union devised and which was tabled in 2009 at the World Intellectual Property Organisation (WIPO), a UN body based in Geneva. Most WIPO Member States support the proposal but the EU Council and Commission have steadfastly maintained that soft law “recommendations” and voluntary licenses are a “better” alternative. EBU does not agree. Unlike the Council and Commission, the European Parliament has been generally supportive of the treaty proposal. In November 2010 101 MEPs signed a letter from the European Blind Union to single market Commissioner Barnier, in favour of a treaty. Luigi Berlinguer MEP, who co-hosted the event, maintained that the matter was a rights issue. Even in 2011, blind people and others living with a print disability such as those with dyslexia still have very limited access to books and other published works. Only some 5% of published books are ever made accessible in richer countries, and less than 1% in poorer ones. We call this a “book famine”. Increasingly, affordable and rapidly developing technology such as e-books is becoming accessible to print disabled people. This digital revolution ought to help end the book famine by allowing us to share accessible books worldwide. However, copyright law has not changed in line with the technology. Often copyright law prevents both the making of accessible books at national level and the sharing of them across national borders. The World Intellectual Property Organisation (WIPO) makes treaties and other international laws on intellectual property rights such as copyright and patents. The World Blind Union, assisted by copyright experts, drafted the treaty proposal. The governments of Brazil, Ecuador and Paraguay then tabled it at WIPO in 2009. – Still respect copyright law: it is not an attack on publishers! The WIPO Standing Committee on Copyright and Related Rights (SCCR), which meets twice a year, is considering the WBU treaty proposal. Its June 2011 session will have an extra three days to specifically consider the WBU proposal and three others that have since been tabled to deal with the issue of print disability. 1. Only one third of the world’s countries have a national exception to copyright law to allow the making and distribution of accessible format books. All countries need such an exception, because publishers often fail to help by making their books accessible or authorising specialist organisations to do so. The treaty would create such exceptions. 2. The national nature of copyright law prevents the import and export of accessible books. The treaty would remove this legal barrier to sharing resources across borders. That would allow many hundreds of thousands of books to circulate between blind people’s organisations in different countries. 3. But aren’t the “EU Stakeholder Dialogue” and the WIPO “Stakeholder Platform” better / speedier / more effective solutions? No. These are at best partial solutions. They will never provide the same level of coverage that a binding international treaty could do. Whilst we want to work with publishers on appropriate licenses, those they are proposing for these dialogues are far too complicated and are a step back from many licensing agreements we have now with publishers. In any case, these agreements are by their nature more subject to change than a hard law. They also are at best only appropriate for developed country organisations with big resources. Given these concerns and the need for EBU and WBU to focus our scarce resources effectively, we have suspended our participation in the EU Stakeholder Dialogue and WIPO Stakeholder Platform pending the agreement in WIPO of a binding international copyright exception along the lines of our treaty proposal. EBU (European Blind Union) is a non-governmental, non profit making European organisation founded in 1984. It is one of the six regional bodies of the World Blind Union. It protects and promotes the interests of blind and partially sighted people in Europe. It currently operates within a network of national organisations of the visually impaired in 45 European countries.